A full moon is visible in this view above Earth's horizon and airglow, photographed by Expedition 10 Commander Leroy Chiao on the International Space Station. A bright full moon on a dark, clear night is always an impressive sight, but did you know that each full moon of the year has its own name? Sometimes, the full moon of each month even has more than one name, all of which originated in antiquity. Full moon names date back to Native Americans living in what is now the northern and eastern United States. Those tribes of a few hundred years ago kept track of the seasons by giving distinctive names to each recurring full moon. Their names were applied to the entire month in which each occurred. Since the lunar ("synodic") month is roughly 29.5 days in length on average, the dates of the full moon shift from year to year. Jan. 19, 4:21 p.m. EST – Full Wolf Moon: Amid the zero cold and deep snows of midwinter, the wolf packs howled hungrily outside Indian villages. The Full Wolf Moon was also known as the Old Moon or the Moon After Yule. In some tribes, this was also known as the Full Snow Moon; most applied that name to the next moon. Feb. 18, 3:36 a.m. EST – Full Snow Moon: Usually the heaviest snows fall in this month. Hunting becomes very difficult, and hence to some tribes this was known as the Full Hunger Moon. Mar. 19, 2:10 p.m. EDT – Full Worm Moon: In this month, the ground softens and the earthworm casts reappear, inviting the return of the robins. The more northern tribes knew this as the Full Crow Moon, when the cawing of crows signals the end of winter, or the Full Crust Moon because the snow cover becomes crusted from thawing by day and freezing at night. TheFull Sap Moon, marking the time of tapping maple trees, is another variation. The moon will also arrive at perigee only 50 minutes later at 3:00 p.m. EDT at a distance of 221,565 miles (356,575 kilometers) from Earth. 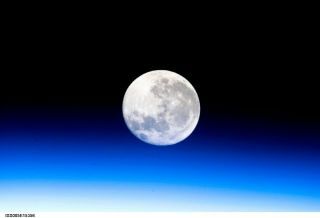 So this is the biggest full moon of 2011. Very high ocean tides can be expected during the next two or three days, thanks to the coincidence of perigee with full moon. Apr. 17, 10:44 p.m. EDT – Full Pink Moon: The grass pink or wild ground phlox is one of the earliest widespread flowers of the spring. Other names were the Full Sprouting Grass Moon, the Egg Moon and – among coastal tribes – the Full Fish Moon, when the shad come upstream to spawn. In 2011, this is also the Paschal Full Moon; the first full moon of the spring season. The first Sunday following the Paschal Moon is Easter Sunday, which indeed will be observed one week later on Sunday, April 24. This, incidentally, is just one day shy of the latest date that Easter can fall. May 17, 7:09 a.m. EDT – Full Flower Moon: Flowers are now abundant everywhere. This moon was also known as the Full Corn Planting Moon or the Milk Moon. Jun. 15, 4:14 p.m. EDT – Full Strawberry Moon: Strawberry picking season peaks during this month. Europeans called this the Rose Moon. There will be also be a total lunar eclipse that will be visible across much of South America, Europe, Africa and Asia. Totality will last an unusually long length of time: 1 hour 40 minutes. Jul. 15, 2:40 a.m. EDT – Full Buck Moon: when the new antlers of buck deer push out from their foreheads in coatings of velvety fur. It was also often called the Full Thunder Moon, thunderstorms being now most frequent. Sometimes it's also called the Full Hay Moon. Aug. 13, 2:57 p.m. EDT – Full Sturgeon Moon: When this large fish of the Great Lakes and other major bodies of water like Lake Champlain is most readily caught. A few tribes knew it as the Full Red Moon because when the moon rises it looks reddish through sultry haze, or the Green Corn Moon or Grain Moon. The occurrence of this full moon on this particular date is rather poor timing for those who enjoy the annual performance of the Perseid meteor shower; this display will peak on this very same day and the brilliant light of the moon will likely wash out all but the very brightest of these swift streaks of light. Sep. 12, 5:27 a.m. EDT – Full Harvest Moon: Traditionally, this designation goes to the full moon that occurs closest to the autumnal (fall) equinox. The Harvest Moon usually comes in September in the Northern Hemisphere, but (on average) once or twice a decade it will fall in early October. At the peak of the harvest, farmers can work into the night by the light of this moon. Usually the moon rises an average of 50 minutes later each night, but for the few nights around the Harvest Moon, the moon seems to rise at nearly the same time each night – just 25 to 30 minutes later across the U.S., and only 10 to 20 minutes later for much of Canada and Europe. Corn, pumpkins, squash, beans and wild rice – the chief Indian staples – are now ready for gathering. Oct. 11, 10:06 p.m. EDT – Full Hunters' Moon: With the leaves falling and the deer fattened, it's now time to hunt. Since the fields have been reaped, hunters can ride over the stubble, and can more easily see the fox, as well as other animals, which can be caught for a Thanksgiving banquet after the harvest. Since the moon arrives at apogee about 10 hours later, this will also be the smallest full moon of 2011. In terms of apparent size, it will appear 12.3 percent smaller than the full moon of Mar.19. Nov. 10, 3:16 p.m. EST – Full Beaver Moon: At this point of the year, it's time to set beaver traps before the swamps freeze to ensure a supply of warm winter furs. Another interpretation suggests that the name Full Beaver Moon come from the fact that the beavers are now active in their preparation for winter. It's also called the Frosty Moon. Dec. 10, 9:36 a.m. EST – Full Cold Moon: On occasion, this moon was also called the Moon Before Yule. December is also the month the winter cold fastens its grip. Sometimes this moon is referred to as the Full Long Nights Moon, and the term "Long Night" Moon is a very appropriate name because the nights are now indeed long and the moon is above the horizon a long time. This particular full moon makes its highest arc across the sky because it's diametrically opposite to the low sun. Last, but certainly not least, this will also be the night of a total lunar eclipse.Viewers across the western United States and Western Canada can catch the total phase before the moon sets. Alaska and Hawaii can see the entire event from start to finish. Central and Eastern Asia and Australia are also well placed for viewing this eclipse (where the calendar date will read Dec. 11). Totality lasts 51 minutes.